Dave Berg: Five Decades of The Lighter Side Of . . .
Running Press Adult, 9780762451616, 272pp. 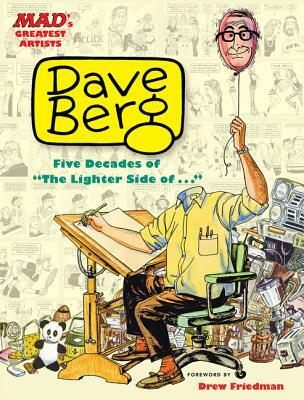 a rare 1970 interview, an introduction and portrait of Berg by well-known American illustrator Drew Friedman, a "growing up with Dave Berg" essay by his daughter Nancy Berg, newly illustrated versions of classic Berg strips by several noteworthy cartoonists, and much more. Dave Berg was one of MAD Magazine's most popular cartoonists. He joined the staff in 1956 and published numerous humor articles before creating "The Lighter Side of . . ." in 1961. His work appeared in MAD for a total of 46 years, until his death in 2002.